From Ray’s Semsar-Africa Director pastor O. J. Felix, I learned that a landslide hit part of Eastern Uganda on the slopes of Mt. Elgon, killing hundreds of people and thousands yet to be traced. 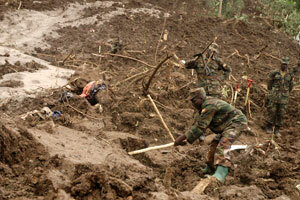 The government is also warning of floods from heavy rains which will complicate rescue efforts. Please keep these people in your prayers. This is the third major disaster killing a majority of people within the last two months. The New Vision newspaper at www.newvision.co.ug. Thank you, Katy. The Lord bless you, too.